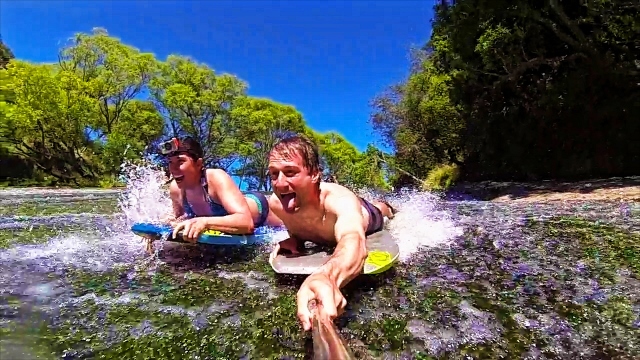 Just north of Gisborne is one of the coolest natural phenomenon – The Rere Rockslide (aka Nature’s slip & slide). 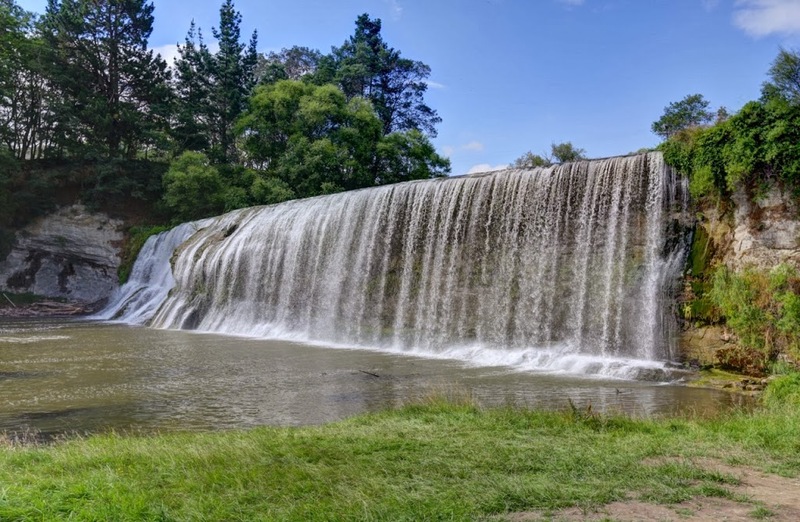 Along the Wharekopae River, this 60m rock slide is made up of constantly running water over a smooth rock bed that feeds into a cushioning large pool at the end. 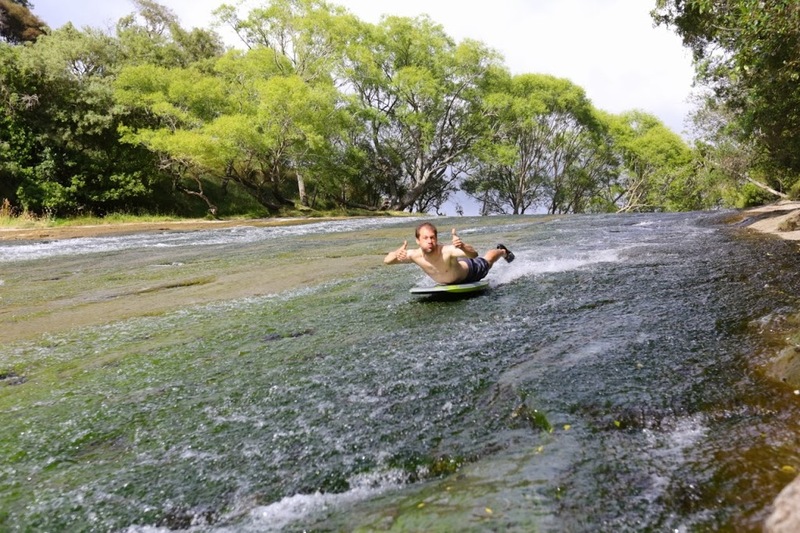 A HUGE step up from riding a wet sheet of plastic down a grassy hill back home! This wild ride attracts people of all ages and with the influx of 20-somethings for the Rhythm & Vines Festival it was a very popular destination. We grabbed our inflatable air mattress and body boards and headed for the river. Despite the crowds of people, we jumped to the top and went barrelling down the rockslide, crashing into the pool below. WHAT AN AWESOME RIDE!! We quickly learned that the air mattress was a leisurely ride, while riding the body boards was more like a rocket ship! It was hilarious to see the variety of objects people chose to ride down, from inflatable chairs, to yoga mats and kiddy pools. And for the unfortunate few, their stomachs! After 2 hours of slip & slide madness, we decided to call it a day but planned to return bright and early the next day before the hung-over kiddos awoke. Sure enough, at 7am the Rere Rockslide was completely empty and we had the waterslide all to ourselves! We spent the next 3 hours flying down the waterslide, running back up again over and over all by ourselves! By 10am though the place was packed again and the brazen students were a source of pure entertainment as they found new ways to throw themselves down the rockslide, crashing into the sidewalls, and each other, on many occasions. Definitely one of the coolest days so far! Just downstream was the beautiful Rere Waterfall – a 5m high and 20m wide waterfall cascading over a similar smooth rockface. Another popular destination, it was packed with students walking in behind the waterfall and jumping through to the pool below. A few brave souls even ventured to the top and after gathering enough courage, leaped to the water below, some with a bit more grace than others. This was definitely one of our favorite adventures so far! The only thing missing to make this Nature’s Hat-trick is if there was a hot pool down the road too!